Inspired by love of the British landscape and steeped in the artisan tradition of the Arts & Crafts movement, she trained in the fine arts, studying painting and sculpture before undertaking an apprenticeship with Quaker potters in the Welsh Marches. Dee has collaborated with the National Trust on a range of ceramics and related products and gives regular knitting design workshops around the UK, including at the Liberty store in London. Her third book of knitting patterns was published in 2018. 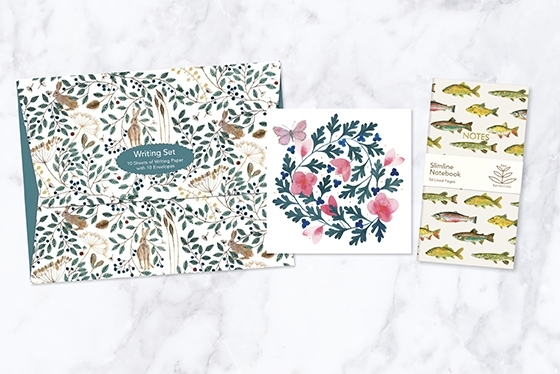 Museums & Galleries launched an exclusive collection of Dee Hardwicke gift stationery in 2018, including gift wrap, notecards and notebooks. To see the full range of our branded products please click on the following link, Dee Hardwicke Products.